Phase 1 - Organizing what we know. Following our brief interest in Ancient Egypt, children began wondering more about the human body. 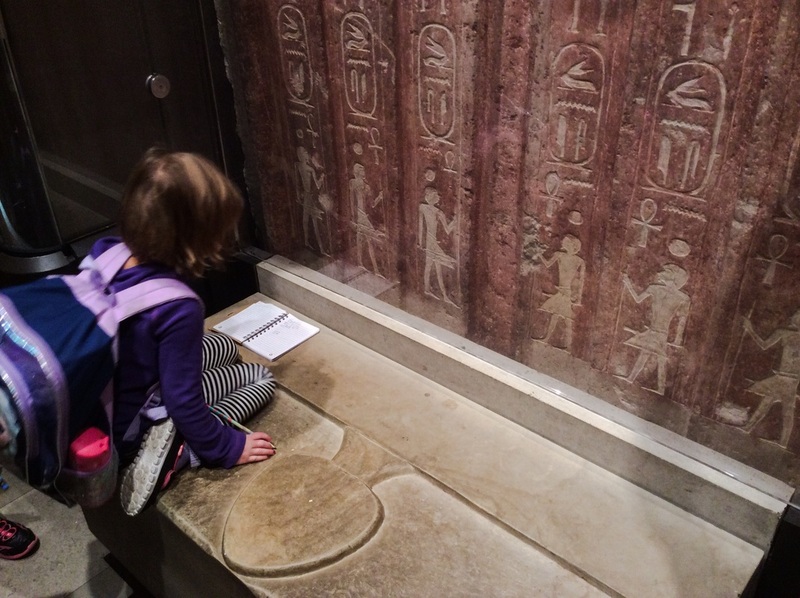 During a visit to the Ancient Egypt exhibit at the Field Museum in Chicago, children made the realization that mummies were actually people that were once living. This simple fact that mummies were once living people became a focal point for deeper investigation. 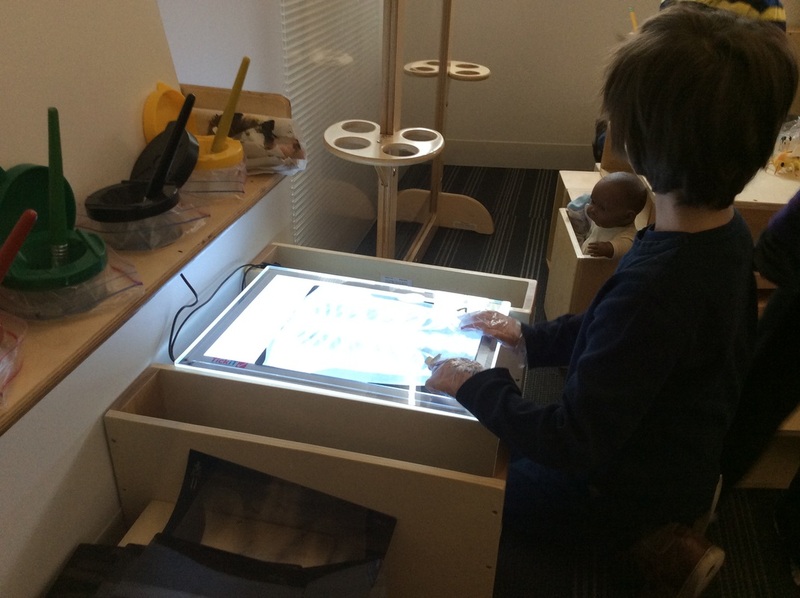 We continued to talk about the children's experience at the Ancient Egypt exhibit and it quickly became clear that the human body was a point of interest. 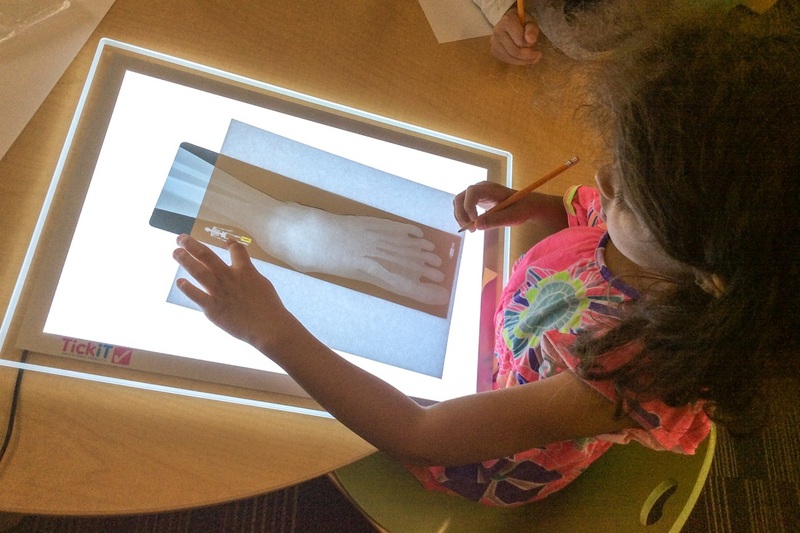 Couple that experience with the imaginative play of "MBC Hospital", where students were using real x-rays to inform medical decisions for play surgery, and we've got a combination worthy of deeper investigation. Yes, this is the actual list from the mouths of children.. can't make this stuff up. I just about hit the floor when I heard a boy say "dermis". The amount of prior knowledge, and interest, in the human body was remarkable to me and so I thought this was a prime opportunity to dig a little deeper and learn more from the children before we started a formal investigation. 3D puzzle brought in by a student, then organized and assembled as a group. 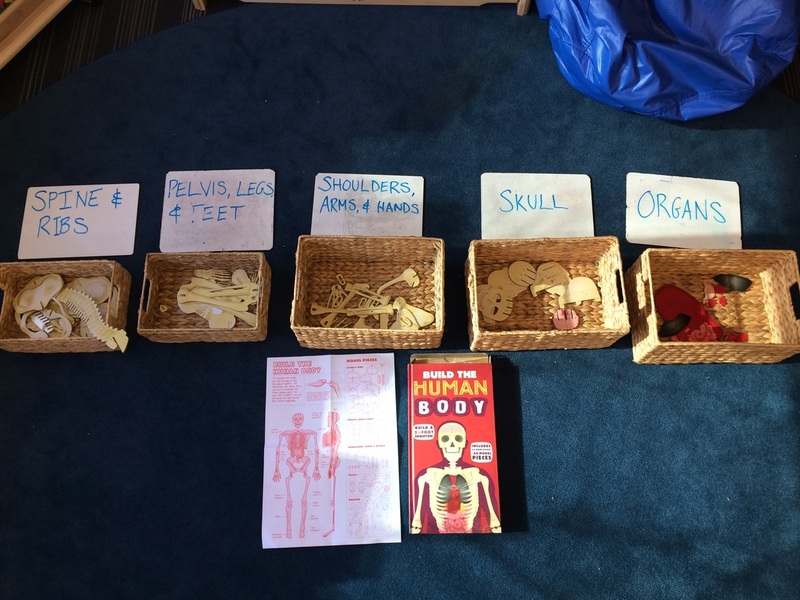 This puzzle helped children build a better understanding of the skeletal system and learn that the organs are part of a separate system of the body. To help scaffold the learning, we sorted the body into different systems and decided to investigate each system separately. At the end, we will layer all the systems together and talk about the way they work together. I'm not exactly sure how many of the systems of the body we will investigate. The first system we decided to investigate is the skeletal system. 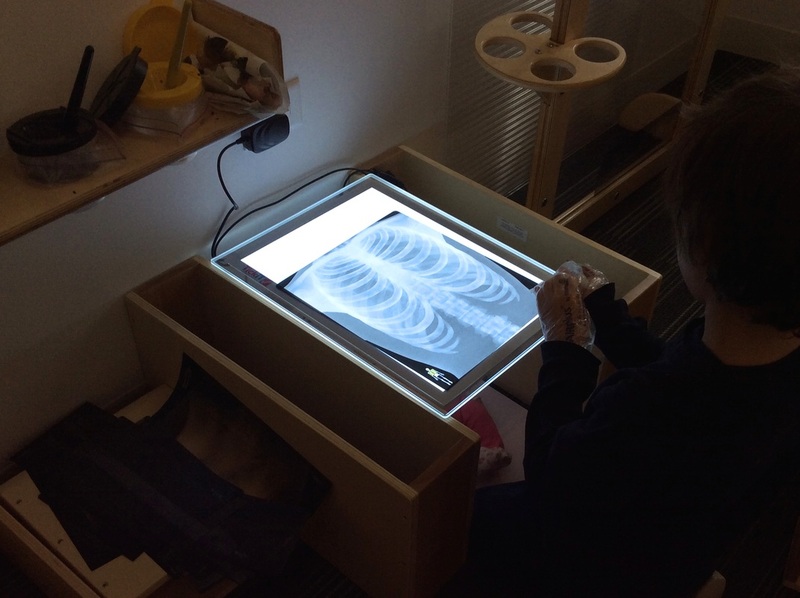 Children put together a three dimensional puzzle of a skeleton (pictured above) that also included some body organs. Next, we did an up close inspection of model skeletons in the classroom and each child tried drawing the skeletal system into the outline of a human body (pictured in the slideshow to the right). We have also been reading some textbooks and watching some educational videos about the body to learn more about the bones that comprise the human skeleton. There are 206 bones in the body, with many of them comprising the hands and feet, and it's fascinating to watch the children draw their interpretation of the human skeleton. 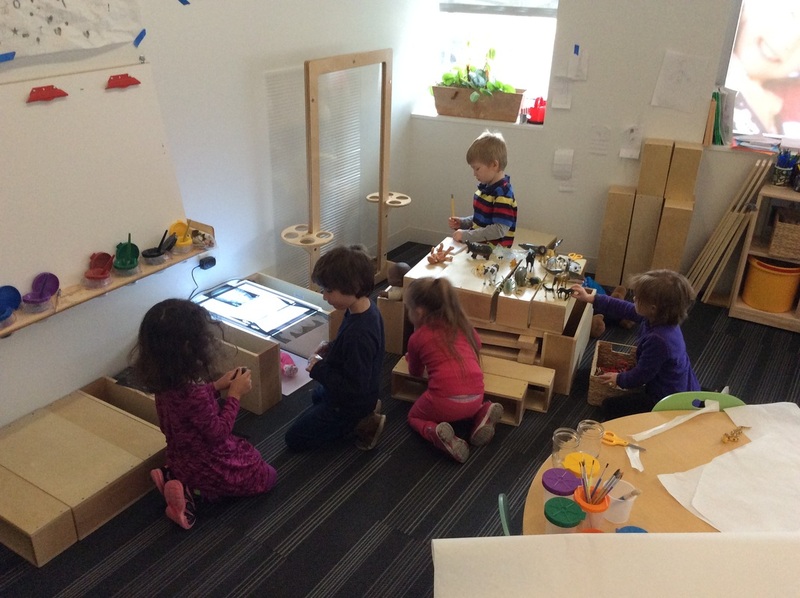 As our collective understanding of the skeleton and body continue to grow, so will the projects we work on in the classroom and TinkerLab. Another attempt at drawing human skeletons was to outline each child's body on the whiteboard and have them draw-in the bones. This iteration of drawing the human skeleton was (at least) the second attempt for each child. Each child drew their skeleton from memory. It's been very interesting to compare the individual drawings to look for patterns, similarities, and differences. Can you find any between the drawings below and the paper/pencil drawings from above? Saying goodbye to our whiteboard skeletons one at a time. The final skeletons (below) were also included in an estimation activity where children guessed how tall their body was in feet. We then measured them to the nearest half foot with foot long objects. Eventually we had to erase the skeletons on the wall. 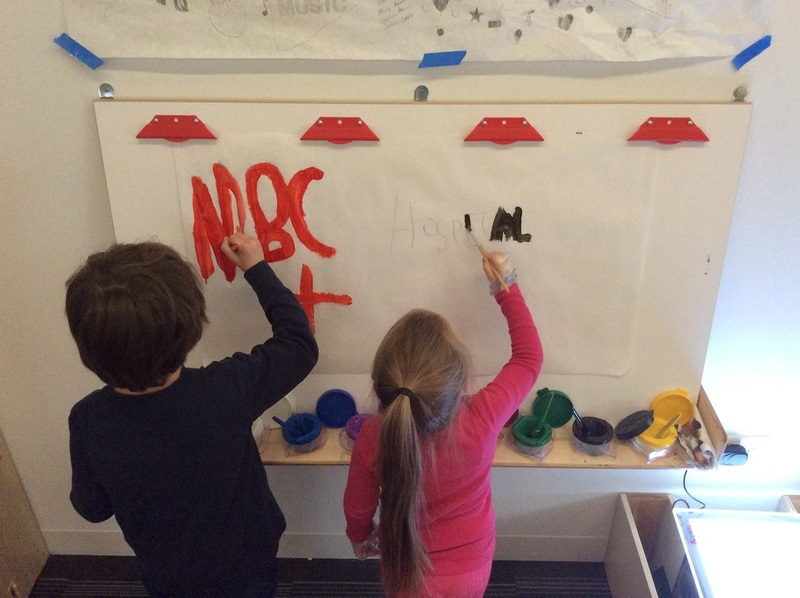 The children didn't seem too concerned about erasing the skeletons. Part of the confidence in erasing might have come from the fact that they will be making full size skeletons on paper.